Offers are an excellent way to turn users into leads and build out your marketing list. These leads you’re generating are in the discovery phase, so the information provided in your offer should establish your practice as an authority on the subject, and a follow-up campaign should be created to stay top of mind. Offers are made up of three main components: the Offer Page, the Thank You Page/Email, and the Offer Form. We’re going to start with the Offer Page, and then we’ll cover the Thank You Page/Email and the Offer Form. 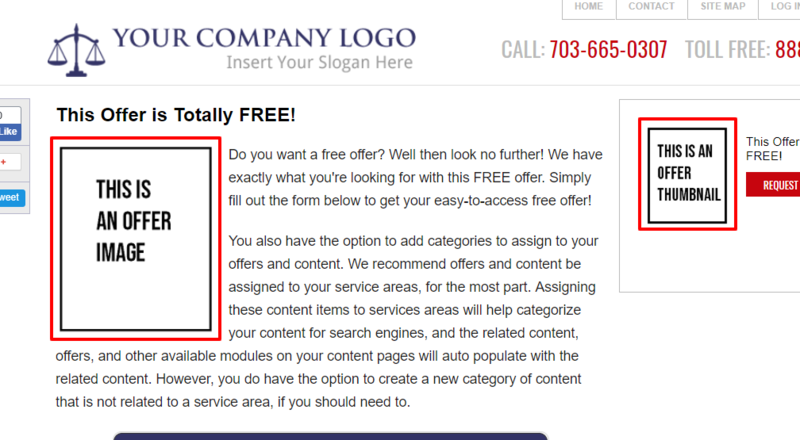 When creating or editing an Offer page, you will notice the standard content fields, as well as a few extra. Media Type of This Offer is the very first field on the page, and this drop-down option helps to keep your offers organized within DSS. It is also used by some sites to display templated page designs. If you want to design a unique offer page layout, contact Customer Service to learn more! You will also notice the option to add an image and thumbnail image to your offers. The offer image will appear on the offer page, next to the content, and is usually an image of the item you are offering (book cover, DVD, pamphlet, etc.). The thumbnail image will appear in sidebar modules when that offer is assigned to a page. You also have the option to add categories to assign to your offers and content. We recommend offers and content be assigned to your service areas, for the most part. Assigning these content items to services areas will help categorize your content for search engines, and the related content, offers, and other available modules on your content pages will auto-populate with the related content. However, you do have the option to create a new category of content that is not related to a service area, if you should need to. If you have more than one offer assigned to a service area or category, you can sort the order in which those offers appear on your site. You have the option to attach a pdf to the auto-response thank you email, or to include as a download link in the Thank You Page or Thank You Email content. To do this, upload the file under “Digital File” and then switch the toggle to the “on” position to include the file attachment with the Thank You Email. A link to this file can also be included in the Thank You Page and/or Email Content by using the "Download Link" merge tag found in each of those rich content editor's toolbar option. Learn more about this option under “Thank You Page” below. You can toggle the switch here to display the center contact form on this page, or you can scroll to the bottom of the page and assign the “Offer Order Form” module to have the form appear on the sidebar of your offer page. 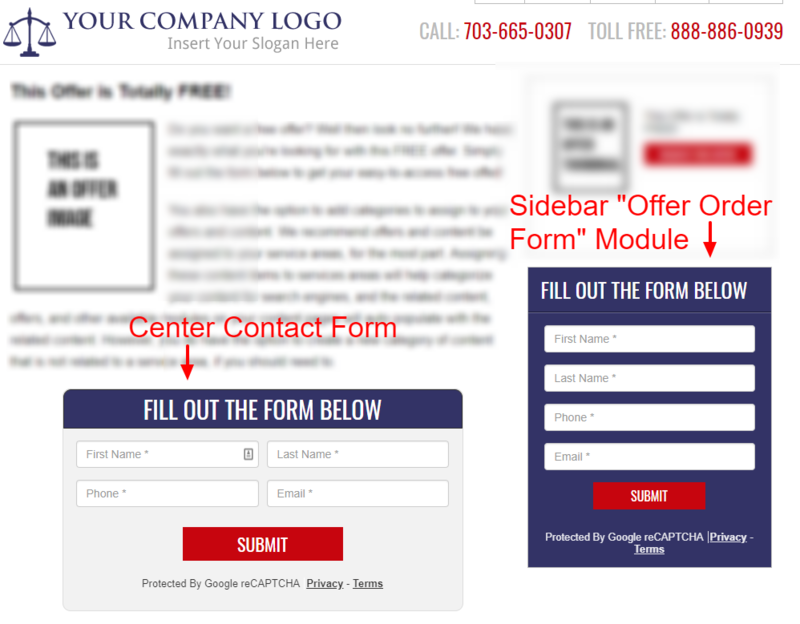 If you do not display the center contact OR assign the “Offer Order Form” module, the form will not appear on your site and users will not be able to fill out or submit the form. Learn about editing your forms below. Each of your different content types (blogs, articles, videos, offers, etc.) has an overview page. The overview page acts as a “parent page,” and the individual pages within that section will automatically populate on that page. On your Offers Overview Page, you have buttons that take you to the individual offer pages. This field allows you to edit the button text that will appear on your overview page. 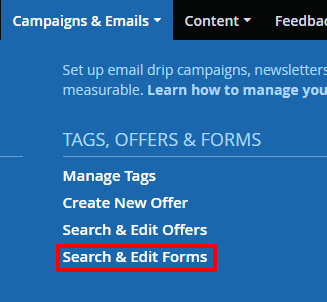 If you have campaigns set up, you can assign one to your offer with this drop-down menu. It’s important to note that any tags associated with the campaign will be assigned to contacts who fill out this form if you assign the campaign here. To learn more about campaigns, take a look at this article. 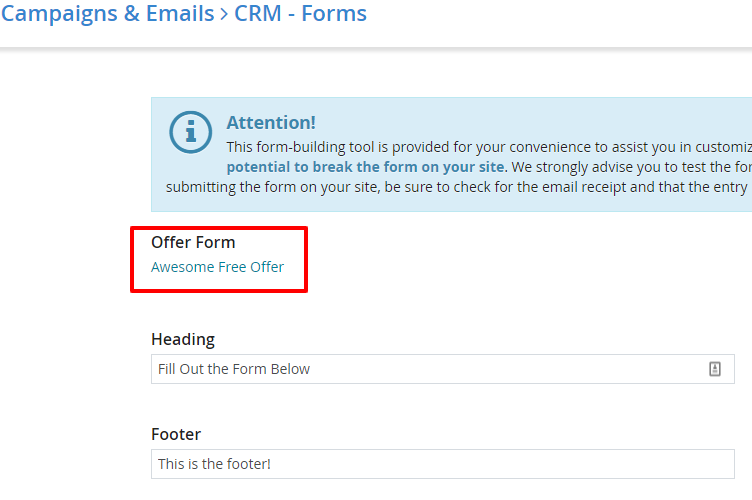 You can also access your offer forms by going to Campaigns & Emails, Search & Edit Forms, or by going to Search & Edit Offers and selecting the “Form” icon to the right of the offer under Actions. The Second Chance Form is an opportunity to offer something else once your contact has filled out the offer form. The idea is to provide the initial offer, and then gather even more data by enticing the user with a second offer. Enabling the Second Chance Contact Form will override the form on your offer page, and request only the users’ name and email address. Any additional form fields you create will be added to the second chance offer form. The content on your Second Chance Page should act both as a “Thank You” page and as an offer form. The user will have provided their name and email address in exchange for the free offer promised on the initial offer page, and if you’ve uploaded a Digital File to your offer, you can use “Merge Tags” to provide the link on the Second Chance Page. After setting up your second chance form (if you choose to use this option), you’ll be able to assign your modules, and once you’re happy with the Offer Page, hit Save! 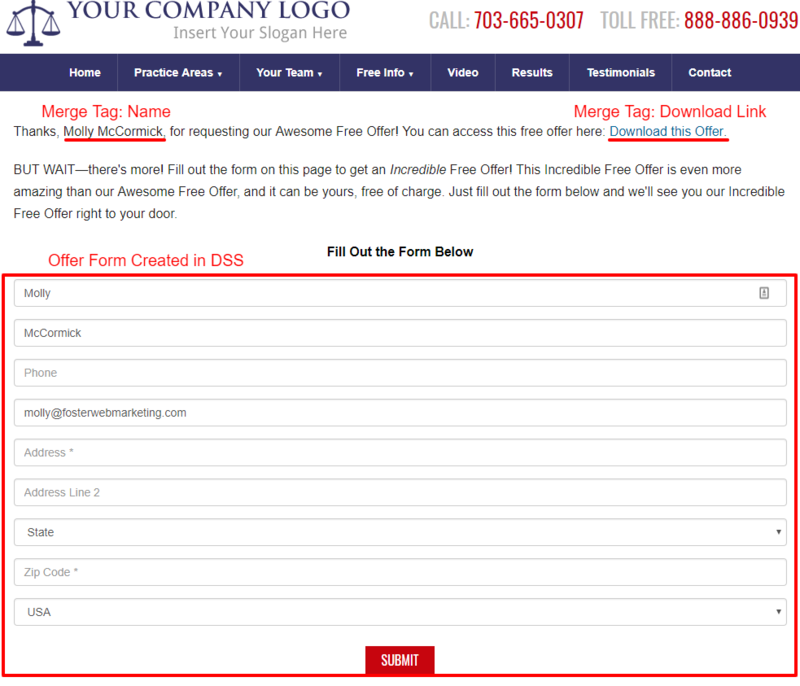 You can also use this merge tag in your Thank You Email, or you can enable “Digital File Delivery Method” to provide the offer as a .pdf attachment. You can add merge tags for any form field you use on your offer form (covered in the next section below). The Sender Email is the email address associated with your Thank You Email, and Sender Email Name is who you want these emails to come from. You can use your practice name and general email address, or you can make these more personal and give users a way to communicate with you or your staff directly. For the email subject line, it’s a good idea to remind your users why you are emailing them. People can be forgetful, so using a subject like “Thank you for requesting our free offer,” will eliminate any confusion and refresh their memory if they have not checked email in a while. To override your Lead Notification Contact Emails and designate one email address to receive notifications for this specific offer, use the Offer Manager’s Email field. This is helpful if you use an outside company for fulfillment, or just want these notifications to go to a different email address. A Custom Thank You Page URL simply lets you control the URL of the Thank You Page you’ve created. Where you typically see www.yoururl.com/reports/thank-you.cfm, you will now see www.yoururl.com/reports/your-custom-thank-you-page-url.cfm. The Custom Form Handler URL allows you to create an offer page on your site but point users to another URL to handle the order page. For example, some of our clients have their books on Amazon, so you may choose to send people to Amazon to download your book, rather than having the user download the book from your site. When using this option, your form will no longer appear on the page, and instead, you will see a button that points users to the Custom Form Handler URL. After you’ve set up your Thank You Page and Email, it’s time to move on to the Offer Form. All Offers need a Form to allow users to submit their contact information. This list should live in your Customer Relationship Management (CRM) tool, where you’ll send follow-up campaigns, email newsletters, and general marketing emails. You have the option to use your own third-party CRM to build and manage your forms, or you can keep everything all in one place and make your life a little easier by using the DSS CRM. On the form page you’ll see a link to edit the associated Offer Page, but perhaps more importantly, this title lets you know you’re in the right place, and editing the correct form! You will also see the option to Clone Another Offer Form. You can use this option to copy the form fields of another form, but the Heading, Footer, Intro, and Button Label fields will not be copied over. Any tags assigned to a form will be added to contact records who fill out the form. Learn more about tags here. Inputs are your form fields—this defines the information you’re requesting from your users. Click the arrow icon to the right of “Inputs/Groups Available For This Form” to expand the options and see examples of how each type of input works. A Text Input is used for collecting things like names and physical addresses, as well as email addresses and phone numbers. For names and physical addresses, assign the input and be sure “Text” is selected for type, and for email addresses and phone numbers, select the appropriate type. This will prevent a user from putting a name in a phone field. The Label is what users see above the form field, and the placeholder will sit in the form field until a user clicks into it to start filling out their information. These are typically the same to avoid any confusion. You can always view a preview of your form at the bottom of this page in DSS if you are unclear about anything. To learn more about forms and how form logic works, check out this article on conditional formatting. Need help setting up your Offers, Thank You Pages, or Forms? Give us a call at 888-886-0939, and we’ll be happy to work with you!